Click the button below to add the Millennials and K-12 Schools to your wish list. A new wave of students now fills America’s schools. 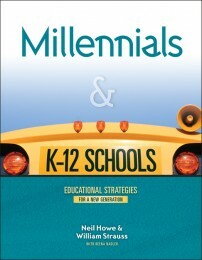 In Millennials and K–12 Schools, generational experts Neil Howe and William Strauss present the latest data on Millennials and how they are changing K–12 schools, and offer hands-on strategies to help school leaders and personnel get the most from their students. Howe and Strauss explain everything-from helicopter moms to the new focus on teamwork and protection, from the new research on “small learning communities” and more rigorous standards to the best way to manage student engagement and continuous academic feedback. The authors also show how school leaders can get Boomer and Gen-X educators to work together and how to harness the energy of emerging Gen-X parents. For each issue, they offer a detailed list of “what to dos” for anyone involved in K–12 education. Ever wonder why these students are so different? They are nothing like the Boomer or Gen-X youth who preceded them. They are pressured and programmed. They are special and sheltered. They are bonded to their parents and networked to their friends. They want structure and instant feedback. They expect to be doted on and served. They work well in teams and have complete confidence in their future. They fear risk and dread failure. They have conventional life goals. They want the system to work. Would you like to know how schools can keep these students engaged, energized, and on track? 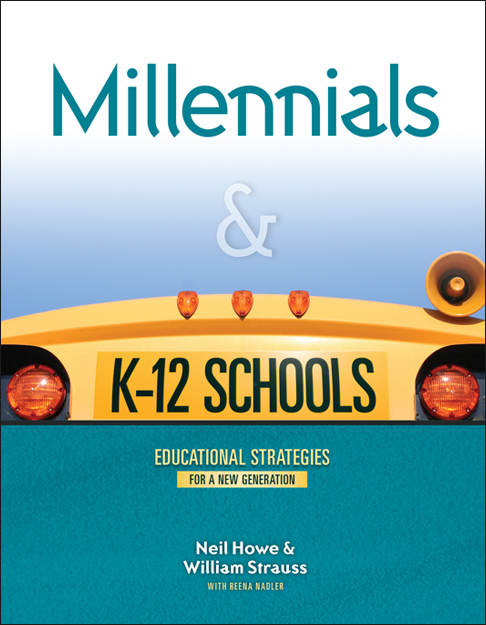 Millennials and K–12 Schools, co-published with the American Association of School Administrators, offers cutting-edge strategies that give you the extra edge. Learn from America’s leading generational experts. National speakers and best-selling authors of such books as Generations (1991), 13th Gen (1993), The Fourth Turning (1997), and Millennials Rising (2000), Neil Howe and William Strauss are America’s foremost experts on generations. Their how-to books on Millennials have been sought after by every institution that handles youth. Their Recruiting Millennials (2000) was put into the hands of every U.S. Army recruiting sergeant and has served as a guidebook for every branch of the U.S. military. Their Millennials Go To College (2003, 2007) was listed in The Chronicle of Higher Education as “favorite reading” among university executives, and has earned them speaking invitations to dozens of campuses and to every major national collegiate association. Their Millennials and the Pop Culture (2006) is helping the entertainment industry navigate the shoals of its fast-changing market. Later this year, they will release Millennials in the Workplace. Articles by Howe and Strauss, and reviews of their books, have appeared in Harvard Business Review, Atlantic, Washington Post, New York Times, Los Angeles Times, Wall Street Journal, American Demographics, and other national publications. Howe and Strauss originally coined the term “Millennial Generation” and have redefined how America thinks about its post-Gen-X youth. Their work on Millennials has been featured on CBS’s 60 Minutes. Their insights into Millennials in the workplace have already been tapped by some of the top HR outfits in the nation, including global consulting firms like Mercer and Accenture, public sector clients like the United Nations, U.S. Army, and Marine Corps, professional groups like the American Staffing Association, investment firms like Goldman Sachs, and large hi-tech manufacturers like Raytheon, ITT, and Northrop Grumman. View an external video review of Millennials & K-12 Schools! How well do you know the Millennials? In a 2006 LifeCourse-Datatel survey, parents agree strongly that they spend more time with their Millennial children than their own parents spent with them at the same age. Nine in ten youth now describe themselves as “happy,” “confident,” and “positive,” and teen suicide rates are trending downward for the first time since World War II. In the 2007 UCLA American Freshman Survey, 70 percent of Millennial teens said it is essential or very important to help others who are in difficulty-the highest response in twenty-seven years. The share of youth reporting “very different” values from their parents has fallen by roughly half since the 1970s, and the share who say their values are “very or mostly similar” has hit an all-time high of 76 percent. An unprecedented and still rising share of high school students are aspiring to go to four-year colleges (7 in 10), and the number of high school students who take and pass Advanced Placement exams has more than doubled in the past ten years. How well is your school or district serving this generation? Get “helicopter parents” on your side by enlisting them as allies in a joint effort to protect and educate their “special” son or daughter (take a cue from colleges with their parent orientations and college-parent partnership contracts). Offer tight cycles of feedback and redirection in the classroom, including continuous monitoring of every student’s progress. Make security measures conspicuously present in every school (clearly marked perimeters, security personnel with uniforms, rules prohibiting dress or behavior that set a dangerous tone). Define sheltering broadly to include the seamless delivery of mental health, social, disability, and wellness services. Harness students’ team skills in the classroom through group projects, small learning communities, and interactive networking technologies. Emphasize alignment everywhere-for schools, coursework, and teachers-and closely articulate secondary with postsecondary education. How well is your school or district handling today’s hyper-involved parents? Start relationships with parents early and spell out the reciprocal obligations of parents and schools. Stress a chain of personal accountability for anything that goes wrong, particularly in “zero tolerance” areas like school safety. Offer measurable standards (and data measuring the achievement of those standards) for schools, teachers, and students; provide transparency in all important deliberations about strategy. Collect data on the career outcomes and earnings capabilities of graduates five and ten years down the road. Enable parent choice; present your school as the best option in a competitive market.